SEOUL, South Korea (CNN) -- Former South Korean President Roh Moo-Hyun committed suicide Saturday by leaping to his death from a hill behind his house, the government announced. 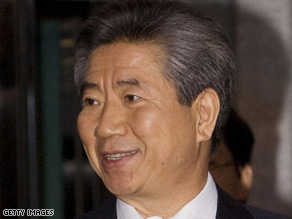 Former South Korean President Roh Moo-Hyun served from 2003-2008. Roh, who was president from 2003 to 2008, had gone hiking near his home with an aide about 6:30 a.m. Saturday (5:30 p.m. ET on Friday), the state-run Yonhap news agency said. He was found later with head injuries, and died at 9:30 a.m. after being taken to a hospital in Busan, police said. A hospital spokesman declined to comment. Roh left a suicide note for his family that family lawyer Moon Jae-in handed out to South Korean media. News reports said Roh wrote it on his computer about half an hour before he left the house. "I am in debt to too many people," the note reads. "Too many people have suffered because of me. And I cannot imagine the suffering they will go through in the future." Roh's death came amid an investigation into a bribery scandal that had tarnished his reputation. Prosecutors were investigating the former president for allegedly receiving $6 million in bribes from a South Korean businessman while in office. Roh's wife was scheduled to be questioned by prosecutors Saturday, and Roh was planning to answer a second round of questions next week. With Roh's death, prosecutors said, the case against him has been suspended. The former president said he learned about the payments only after he left office and that some of them were legitimate investments, Yonhap reported. Roh's suicide note said his health was poor and that "nothing is left in my life but to be a burden to others." "Don't be too sad. Aren't life and death both a piece of nature? Don't be sorry. Don't blame anyone. It is fate," he wrote. The note asks that his body be cremated and for a small headstone to be left near his house. "It's what I have thought about for a long time," he writes at the end. Although Roh had not made a formal guilty plea, many were disappointed that a man who came to power vowing an end to corruption would face such allegations. U.S. President Barack Obama said in a statement he was "saddened" by news of Roh's death. "During his tenure, President Roh contributed to the strong and vital relationship between the United States and the Republic of Korea," Obama said in the statement issued by the White House. "On behalf of the government of the United States, I offer my condolences to his family and to the Korean people." Roh hoped to leave a legacy of improved relations with North Korea. Just before he left the presidency, Roh became the first South Korean leader to cross the demilitarized zone and meet with North Korean leader Kim Jong Il. Roh believed in the "sunshine policy" of his predecessor, Kim Dae-Jung, that sought to engage the north, and Roh also promised aid. Roh spoke to CNN correspondent Sohn Jie-ae just after that trip and said he thought his legacy would be to ensure that many others crossed the demilitarized zone after him. The current South Korean president, Lee Myung-Bak, however, takes a harder line on the north and has so far not continued Roh's efforts. CNN's Sohn Jie-ae contributed to this report from Seoul.